This weekend was all about the snacking for me. I was pottering about the house idly working through chores, eating delicious food and watching the last weekend of the Olympics. When good television is on I do like to indulge in the snacks, there was a lot of snacking these past few days. 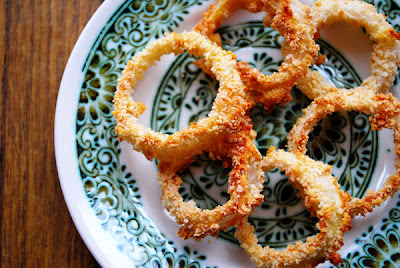 But, one of the more healthier snacking options was a plate of these Baked Onion Rings. Instead of coating the onions with batter and frying them, they are dipped in breadcrumbs and popped in the oven for 20 minutes. Healthy and delicious, these onion rings are a treat. They are so simple to make, but a little messy with all the dipping. But that's the fun type of cooking isn't it? I found the best technique is double dipping on the flour and egg stage. This gives the breadcrumbs a stronger 'glue' to hold onto. I just used the breadcrumbs in my cupboard which are quite thick and coarse, but next time I might try a finer type of breadcrumbs with a Panko consistency. Slice the onions horizontally and separate into rings. Sift the flour into a bowl and gently mix in the spices. Whisk the egg with the milk in a seperate bowl. Pop the breadcrumbs into another bowl and season generously with salt and pepper. Take an onion ring, dip into the flour and then into the egg. Dip back into the flour and then the egg again before dropping it into the breadcrumbs. Carefully ensure all sides are coated and place the onion ring on a baking tray. Repeat the process until all onion rings are prepared. Place in the preheated oven at 200C for 10 minutes. 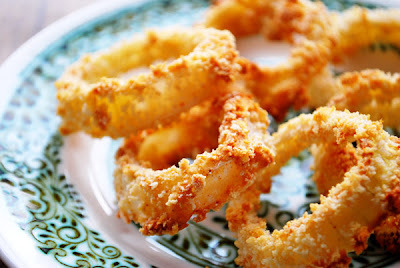 Turn the onions rings carefully and bake for a further 10-12 minutes until the breadcrumbs are golden. I want these right now. They look delicious. Urgh, those horrible flaccid things that you get from pizza takeaways. They're all sorts of horrible. am gonna try these tonight, thanks!